About - The Original Spectrum Painting Co. Inc. The Original Spectrum Painting Company was formed in 1984 by Korbet McEniry, a second generation painting contractor. Starting business in the residential re-paint market, then expanding to various commercial projects such as; Benjamin Franklin branches around the Portland area, Rono Graphics Printing building, Metro recycling, Harley Davidson, and several area restaurants. In 1988 we started painting custom homes in Charbonneau. 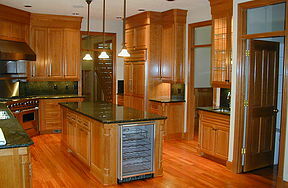 We never looked back when it came to custom homes and began specializing in “high-end” fine wood finishing’s. We participated in the painting and finishing of four different homes in the Street of Dreams, all in different years. In the past twenty-five years we have worked for many prestigious “high-end” custom home builders. Returning to our humble beginnings, we still continue to provide quality interior and exterior painting for the residential re-paint customer. Today 80% of our business comes from referrals and repeat business from our loyal clients. We would like to thank our thousands of satisfied customers that have made Original Spectrum Painting a success for the last quarter of a century. copyright © 2017 The Original Spectrum Painting Co. Inc.